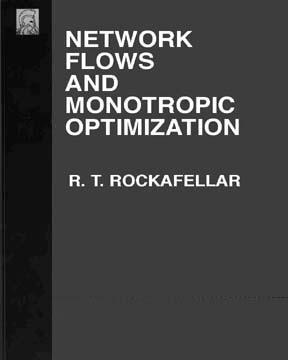 A rigorous and comprehensive treatment of network flow theory and monotropic optimization by one of the world's most renowned applied mathematicians. This classic textbook, first published by J. Wiley & Sons, Inc., in 1984, covers extensively the duality theory and the algorithms of linear and nonlinear network optimization optimization, and their significant extensions to monotropic programming (separable convex constrained optimization problems, including linear programs). It complements our other book on the subject of network optimization Network Optimization: Continuous and Discrete Models (Athena Scientific, 1998). Monotropic programming problems are characterized by a rich interplay between combinatorial structure and convexity properties. Rockafellar develops, for the first time, algorithms and a remarkably complete duality theory for these problems. "By creating an elegant unifying framework for a broad range of subjects, Rockafellar's book represents an important event in the evolution of optimization theory. Besides its creative aspect, the book is thoughtful, well written, and packed with a wealth of material. The large number of exercises (a total of 479! ), most of them extensions and elaborations of the theory, enhance its value as a class textbook, and provide fertile grounds for self-study and inspiration. Every student and practitioner of optimization should take a careful look at this book." The author is Professor of Mathematics and Applied Mathematics at the University of Washington, Seattle, Wash.